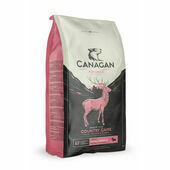 With an animal ingredient content of at least 65%, Canagan Country Game dry dog food is comprised primarily of venison, rabbit, and duck with the remaining 35% consisting of various vegetables, fruit and herbaceous botanicals; including sweet potato, seaweed, cranberry, peppermint, and apple. High in protein to ensure that pets will have what they need in order to lead active, healthy lives, this Canagan dry dog food accurately mimics the kind of diet that dogs would have eaten when they lived in the wild. 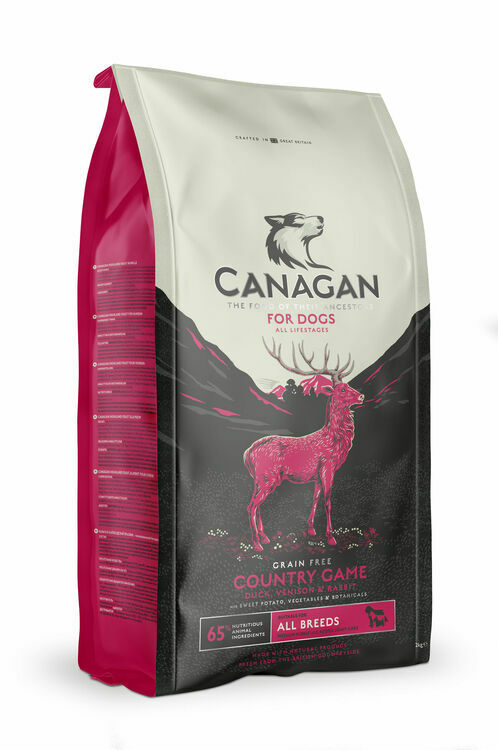 Made using fresh ingredients that have been prepared from scratch, Canagan Country Game is made using a hypoallergenic dog food recipe that is completely free from grain, wheat, corn, and barley; making it the perfect choice for animals with common food allergens and digestive sensitivities. What's more, to ensure that their meals are as tasty and nutritious as they possibly can be, Canagan Grain-free Country Game with duck, venison and rabbit only contains ingredients that are suitable for human consumption. 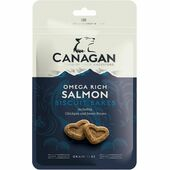 A potent source of Vitamin A, Vitamin D and Vitamin E, this grain-free dog food is also enriched with Omega-3 and Omega-6 fatty acids which will help to keep your dog's skin well conditioned and imbue its coat with a lustrous shine. 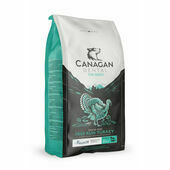 Moreover, by replacing grains and cereal with sweet potato, this adult dry dog food by Canagan will provide your pet's body with highly digestible slow-release carbohydrates, as well as antioxidants that will help to support the immune system. 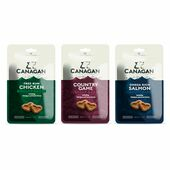 Ingredients: Freshly Prepared Deboned Duck (16%), Dried Duck (12.5%), Sweet Potato, Dried Herring (8.5%), Freshly Prepared Deboned Venison (7.5%), Peas, Potato, Turkey Fat (5%), Dried Rabbit (4%), Dried Venison (4%), Dried Egg (3.75%), Alfalfa, Pea Protein, Salmon Oil (2.25%), Chicken Gravy (1.5%), Potato Protein, Minerals, Vitamins, Apple, Carrot, Spinach, Seaweed, Fructooligosaccharides, Psyllium, Camomile, Peppermint, Marigold, Cranberry, Aniseed & Fenugreek. 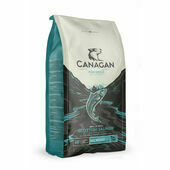 My dog enjoys this food. 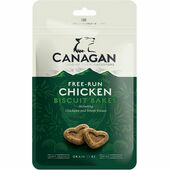 my terrier cross was leaving his kibble ( a good brand)untouched, but now gobbles up every button of this canagan kibble. i can't believe how differently he behaves compared to the other kibble to be honest but delighted! My cockapoo has become very fussy with her food. 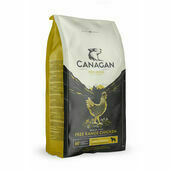 This was recommended and has been a great success, empty dog bowl now. The whole process of ordering the food was easy and stress free, delivery was exceptionally prompt. 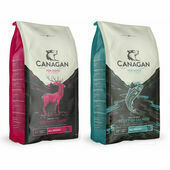 Would use company again! !